One of the new microbes discovered by Dal researchers. On a sunny spring day in 2016, Yana Eglit tucked herself away in the lab where she works to earn her PhD in biology. She peered down the eyepieces of a microscope, examining a soil sample she picked up while on a hike near Halifax a few weeks before. She was investigating the microbial species present in the dirt when an unusual movement caught her eye. Yana Eglit at work in the lab. What Eglit found that day were not one but two different species of rarely-observed hemimastigotes, a group of microbes that hadn’t yet been assigned a place on the Tree of Life. These two organisms would lead Eglit and a group of Dalhousie biologists from the Faculties of Science and Medicine to a rare discovery, published this week (Nov. 14) in Nature. Scientifically speaking, the two species of hemimastigotes found in Eglit’s sample are eukaryotic protists with two rows of flagella. Eukaryotic means the species have complex cells like humans and protist means the species are not animals, plants or fungi. Like most protists, they are unicellular. Their flagella are long hair-like structures that allow these organisms to move, and also help them to capture other microbes, which they consume as prey. The first hemimastigote species Eglit identified among the specks of dirt was Spironema. It had only been observed microscopically, just a few times since the 19th century. 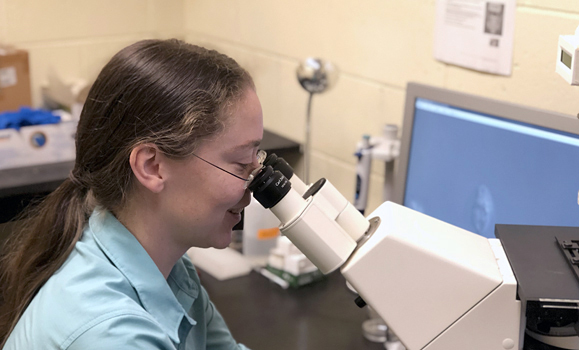 While Eglit had been hoping she would find Spironema one day, she wasn’t expecting to discover a second hemimastigote species in the same sample —a species that hadn’t yet been discovered and named. In naming it Hemimastix kukwesjijk, the research team pays tribute to where the second microbe was discovered: in Nova Scotia, territory of the Mi’kmaq First Nation. “Kukwes,” explains Dr. Simpson, is a “ravenous, hairy ogre” in Mi’kmaq folklore. The team says this predatory microbe looks and behaves like an ogre in miniature. With two rare microbes at their disposal, the team got to work. Erin Bertrand, another biology professor and Canada Research Chair in Marine Microbial Proteomics, Andrew Roger, a molecular biology professor in the Faculty of Medicine, and two more front-line researchers, PhD candidate Gordon Lax and postdoctoral fellow Laura Eme joined efforts to unlock the mysteries these microbes had kept under wraps all these years. Their collaboration was made possible through Dalhousie’s Centre for Comparative Genomic and Evolutionary Bioinformatics (CGEB). “We would have not been able to do this work alone as one lab. Everyone involved in this was essential,” said Eglit. With the mixed and short-lived microbial material they had to work with, the team turned to innovative technologies that could help them sequence the genetic information—a first step to understanding what they found. Lax used a technique called single-cell transcriptonomics on cells roughly four times smaller than a single strand of human hair is wide. 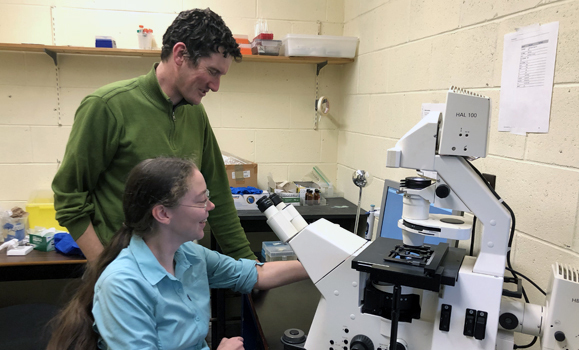 Eglit and Dr. Simpson explain that when a new microbial species is identified, and its genetic information is compared to other species, it almost always turns out to go into one of those already-defined kingdoms. But hemimastigotes formed their own deep branch, making this discovery truly rare. Discovering a new biological kingdom wasn’t the last chapter for the research team. Eglit figured out how to maintain growing populations of Hemimastix kukwesjijk, becoming the first person ever to culture a hemimastigote. “The information we have so far is good snap shot. It represents parts of the genomes of those two species, not the whole genome,” explains Dr. Simpson, adding that the ability to grow the microbe in a lab (that is, to culture it) will make further studies much easier. These findings are vital for evolutionary biologists striving to piece together how the complex cells of animals, plants, fungi, algae and protozoa have evolved over the last 1-2 billion years. Further, ecologists around the world studying the hugely important roles of microbes on the planet will now be able to identify hemimastigotes in their genetic datasets; this biodiversity would have passed as unidentified until now.